Tyagaraja at Tiruvarur (and at the other Saptavitanka Stalams) represents the Somaskanda manifestation of Shiva - with Uma and Skanda and is full of symbolism and mystic significance. It is to be noted that Somaskanda represents the processional image of Shiva in most Saivite temples and there is thus a shrine for Somaskanda in almost all Saivite temples. The image of Tyagaraja at Tiruvarur is said to have been held in worship by Mahavishnu and later by Indra the King of the Gods and then later on by Muchukunda Chakravarti a valorous king. The Tyagaraja shrine at Tiruvarur is associated with the Ajapaa Natanam dance which is enacted every time the deity is taken out in procession. Raja Raja Chola I who built the Brihadeeswara Temple at Thanjavur installed a shrine for Dakshina Meru Vitankar there. The name Tyagaraja became associated with Somaskanda only from the 16th century onward (the earliest references to Somaskanda as Tyagaraja go back to the 12th century CE). Until that point in time, this image was referred to as Veedhi Vitankar in Tamil and Aaruradipati in Sanskrit. Symbolism: Associated with the image of Tyagaraja (The King of Givers) are symbols such as the manittandu or the sceptre, senkazhuneermaalai or the garland, ratnasimhasanam or the throne and a sword. The panchamukha vaadhyam, the paarinaayanam (nadaswaram) and the suddha maddhalam drum are special musical instruments associated with this shrine. These instruments are played during worship services. The aazhitter - or the collossal chariot and the airavatam elephant are other royal objects associated with Tyagaraja. 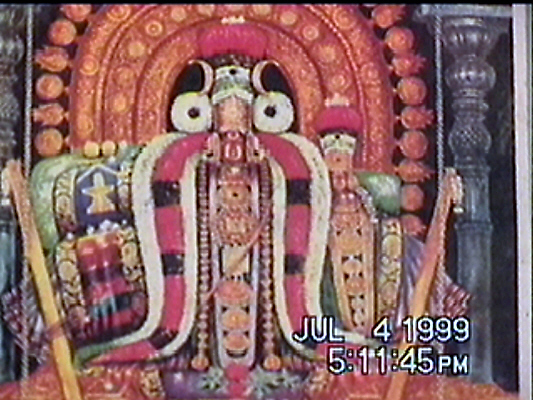 Even the Nandi in front of the Tyagaraja shrine is portrayed in a standing posture. Mysticsm: There is a sense of mysticism associated with the image of Tyagaraja. Abhishekam rituals are performed to this image only six times a year, and even during these occasions the entire image is kept covered with a piece of cloth, barring the faces of Shiva and Parvati. On a daily basis, abhishekams are performed to an emrald Shivalingam placed in the shrine. Again, the image of Tyagaraja is always kept covered with decorative cloth, but for the faces of Shiva and Parvati. The feet of the image are kept uncovered only on two occasions each year - namely Maargazhittiruvadirai and Panguni Uttiram. The former is referred to as Dakshina Paada Darisanam while the latter is the Uttara Paada Darisanam corresponding to the darker and the brighter halves of the year.